Hellboy: Rise of The Blood Queen (2019) movie synopsis and official trailer are probably sought by a lot of people today. This upcoming superhero movie is back on the big screen in April 2019. Well, it is considered as a sequel to the second installment on Hellboy movie franchise, which is Hellboy II: The Golden Army released in 2007. However, some people consider this highly-anticipated upcoming movie as a remake of the 2004 movie of the same name. No one seems to get bothered by that dispute because Hellboy is already a beloved character. Moreover, having it back on the big screen is something many people have been waiting for. Here’s more information about the upcoming movie for you. As we know, in the upcoming movie, the whole story is not revealed yet, of course. However, based on the teaser plot given by Lionsgate as the production company, this movie is apparently still revolving around the adventure of Anung Un Rama a.k.a Hellboy. This red powerful demon is the main protagonist of the movie. In addition, the actor playing Hellboy is David Harbour. If you love watching Netflix's Stranger Things, the name is probably quite familiar for you. For your information, it is believed that the plot of this movie is going to bring you to the ancient medieval world. Hellboy is expected to stop a sorceress from ancient medieval time, named The Blood Queen, who has an evil scheme to destroy the world, and of course, endanger all of mankind. In this adventure, Hellboy is going to be accompanied by some of his loyal friends, including by Trevor Bruttenholm, his adoptive father. In the trailer, you can see that the setting of this movie is clearly a medieval time. You can also see in the trailer the first glimpse of Milla Jovovich as The Blood Queen, the main antagonist character. Moreover, the trailer also shows you a glimpse of legendary wizard Merlin, played by Brian Gleeson. The Hellboy (2019) movie synopsis and official trailer are probably very odd for some people, especially considering that Hellboy is expected to get involved in brutal fight scenes, not the one with magic and fairies. However, the whole story of this 2019 upcoming movie is believed to be excellent. It combines the dominating presence of Hellboy with the unexplained paranormal events, like magic and supernatural mysteries. 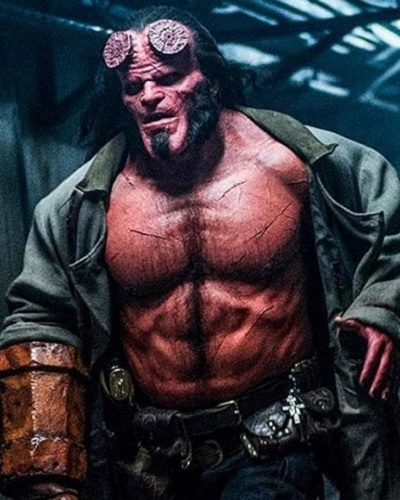 The story is expected to be different from two previous Hellboy movies as well, even though the fighting scenes and mystery suspense are still there for the viewers to enjoy. Well, if you love Hellboy in the form of comic book or movie character, this new Hellboy movie is the one you should consider to watch. It is packed with great casts, nice story, and of course great virtual effect. If you have never read and seen Hellboy (2019) movie synopsis and official trailer, you can catch a bit of the story up there.